Today marks the day that men went to the voting booth and cast their ballots on whether women should have the right to vote in California. It was no easy win. Statewide the vote was 125,037 for and 121,450 against. According to this article in the Daily Review Newspaper, rural areas were more in favor of suffrage than the cities. In fact, the measure lost handily in San Francisco 21,919 to 35,635. I don’t know if any of my female relatives were suffragists. It would be interesting to find out. I do know from newspaper research that some were politically active after they earned the right to vote. 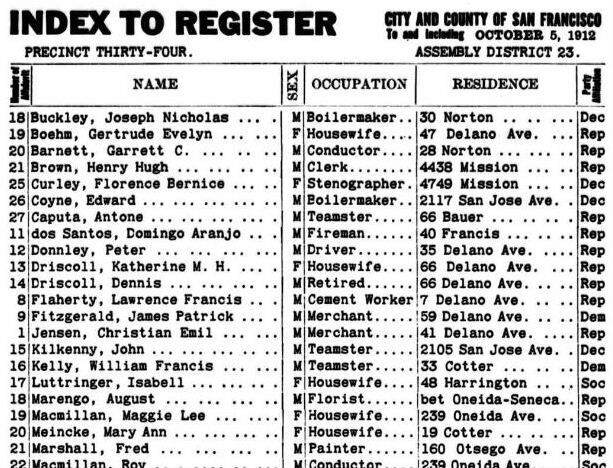 I have spent some time researching California Voter Registration rolls. Though they don’t provide much information beyond name, address, occupation, and political party affiliation, they do shed light on your female ancestors. One of the interesting things I found out was wives were rarely registered with the same party as their husbands. They showed incredible independence in party affiliation. This is the voter register entry for Mary Ann (Kelly) Meincke. She is my first known female relative to register to vote. She was registered in 1912. She was 53 years old when she voted for the first time. Even more interesting is the fact that my Great Grandmother, Maria (de Braga) Pacheco Smith, was registred to vote in 1936. An interesting fact since she was on her death bed and she was not a US Citizen! In fact, she was here illegally. Now I must wonder who illegally registered her or who was voting under my Great Grandmother’s name! Have you worked with voter registration rolls? If so, were you able to learn more about your female ancestors? Voter registration rolls are that one record that your female ancestor filled out for themselves. I provides a little insight into their lives.